The Hoher Markt Square is one of the oldest squares in Vienna - in a sense, it even predates Vienna, as it was part of the Roman army camp Vindobona. Today, there is little (well, actually nothing) left of Roman traces, but there are several reasons whey tourists come in crowds. Obviously, they do not come for the vast numbers of cars that park here or the ugly supermarkets that embrace the square - but rather for such pleasant things to watch as the "Vermählungsbrunnen" ("Fountain of Marriage"). This Baroque piece of art was created in response to a safe return of the Emperor's son and later renewed to celebrate the marriage of Empress Maria Theresia and Franz Stephan of Lorraine, which later proved to be a highly reproductive connection. The figures displayed, however, are not Maria Theresia and Franz Stephan, but Mary and Joseph at their wedding in front of a High Priest. An event with no record in the bible and thus not much of a tradition in the history of art. The whole thing is protected by a baldachin made of bronze. 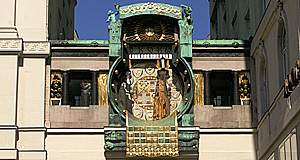 Even more exciting is the Jugendstil "Ankeruhr" or Anker Clock. It was designed by Franz Matsch between 1911 and 1917 for the prospering Anker insurance company and bridges two administrative buildings of this corporation. It is 10 metres wide and 7.5 metres high, just in case that you were wondering. The clock itself has a diameter of 4 metres. The cool thing about it is that 12 celebrity figures from Vienna′s history were made of copper - each hour, one of the figures (or couples) is visible and on the hour, a tune matching with the figure can be heard. Now, the big show starts at noon: Then all the figures with their respective tunes run a round and surely enjoy the cheers of the gathered tourists. Joseph Haydn is the last figure - originally, his tune was the Imperial Anthem (that he had composed and which was later stolen by Germany, where it still serves as the National Anthem). After the revolution of 1918, the Republic of Austria decided to use a different one of his compositions. Finally, there is another attraction on the Hoher Markt: The Neidhart Frescos, the oldest secular frescos of Vienna, discovered only in 1979. This artwork is preserved by the Wien Museum and displays mostly scenes from the life of the faring singer Neidhart von Reuenthal. They are located in Tuchlauben 19. Other nearby attractions include the Stadttempel (main synagogue), Stephansdom, the Peterskiche and the old City Hall of Vienna as well as the Judenplatz Square.